I’ve written here before about the strong connection between mercury poisoning and gluten intolerance. Not everyone with mercury poisoning ends up reacting badly to gluten, but it’s very, very common. And gluten symptoms come in a lot of different flavors, so it can be hard to guess what’s going on unless you pay close attention and do a gluten elimination test. My personal gluten symptoms manifested as a headache, depression, and numbness and tingling in my hands, feet and scalp. When they were really bad, I got the added bonus of tunnel vision. I never got gastrointestinal symptoms from gluten, but diarrhea is another very common gluten symptom, especially among those with the specific autoimmune kind of gluten intolerance called Celiac Disease. I’ve heard of gluten causing lots of other odd symptoms from brain fog to joint pain to rashes and itching. Since everybody eats gluten practically on a daily basis, it can be impossible to tell how it’s affecting you until you go cold turkey. And going cold turkey can be a little bit more complicated that you’d think, since gluten is a surprise ingredients in a lot of unlikely foods. Soy sauce? Rice Krispies? Who knew? Give gluten up entirely for two weeks. It’s not as hard as it sounds. Meat, potatoes, milk, cheese, vegetables, beans, rice, and corn are all naturally gluten free foods as long as they aren’t packaged with any sauces, flavoring or seasoning mix. And these days, you don’t have to give up bread and pasta and other treats as long as you have access to a supermarket with a gluten free aisle. The rest of the world of packaged foods requires a little bit more attention. In the United States, manufacturers are not required to state on their labels whether their product contains gluten, but it’s not too complicated to figure it out. Before you go shopping, visit Celiac.com and print out a copy of their Unsafe Gluten Free Food List. Before you put anything in your cart, check the ingredients against the list to see if it’s got any gluten in it. Don’t put your gluten free bread in the family toaster–crumbs can linger and stick. Toast your bread on a rack in the oven after you have wiped it clean. Don’t share butter, cream cheese, peanut butter etc with gluten eaters. They are full of sticky breadcrumbs. Get your own clean versions of these condiments and write Gluten Free–Stay Out! on them in big red letters. Wipe countertops, cutting boards and oven racks clean before you prepare your food on them. Avoid those darn sticky crumbs! Try not to eat out during your two weeks, but if you must, let your server know that you are ordering a gluten free meal, and get them to ask in the kitchen what’s safe for you to eat. Salads (without croutons) are often a good bet. When you’ve survived your two weeks without gluten, it’s time to test your tolerance. For one meal–and one meal only!–eat a nice big portion of gluten. Then go back to your gluten free ways for the next two days and observe. Does anything come up? Often it doesn’t happen right away. My gluten symptoms never appeared the day I ate gluten, it was always the next morning. If you notice nothing out of the ordinary, then congratulations, you tolerate gluten just fine. But if symptoms come up, whatever they may be, you know what you need to do to keep them from happening again. Going gluten free is not all that bad, once you get the hang of it. And there are some great resources to help you along the way. Danna Korn’s Living Gluten-Free for Dummies is an upbeat, fun read packed with excellent advice on how to manage a gluten free life. She covers everything from eating out to safe ways to share a toaster with a gluten-eater. Bette Hagman’s Gluten Free Gourmet books are a collection of easy-to-make recipes that will impress everyone, even the die-hard gluten-lovers in your life. Gluten free baking is very tricky, but Hagman’s bread and assorted treats turn out great every time. And in the United States, a great resource for finding places to eat with gluten free menus where you can eat out without hassle is www.glutenfreerestaurants.org. ← What is the best mercury detox diet? Hi Áine.. I have a gluten intolerance too. It came on weeks after getting my amalgams. I have stuck to a strictly gluten-free diet for years.. I am very meticulous about it. Thankfully, the availability of GF food in Ireland today is very good. Tesco has a really great range of foods. I can get loads of snacks – Dunnes Stores even does a frozen GF pepperoni pizza. When I first started out, there was only bread that would fall apart when you open it, and that was about it. It had be a chore when eating out at a restaurant however. Mercury most certainly plays a role in gluten intolerance. 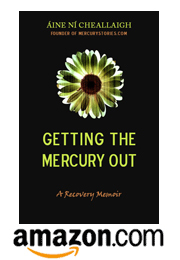 I had my first mercury fillings and one month later my life changed. I knew it was the mercury and found another dentist to take them out, but still sick unto death. 4 years later I am going gluten free and I have 5 days without intense pain. We will see what happens if this is the miracle that cures me.